Take a pan. Boil water, turn off the heat and put tea bags in it for 5 minutes. Take out the bags, add sugar and let it cool. Make sure that it should not be for more than 5 minutes otherwise it will give bitter taste. 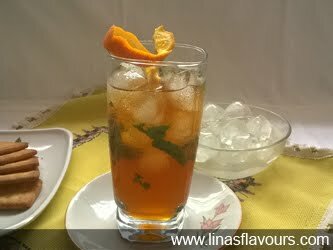 You can use ready iced tea mix also. Add it directly to the cold water. Take a bowl. Add tea and orange juice and mix it. Chop mint leaves and add to tea and mix it well. Take three glasses. Put ice cubes in it. Pour cold tea and serve it.